Below are some answers to commonly asked questions about RULES OF CIVILITY. Commentary on the role of Walker Evans’s photography in the book is included here. Commentary on the role of jazz in the book is included here. If you have other questions or would like to be on my distribution list for rare news of my writing (and receive an occasional short story), please register on my Contact page. Q. 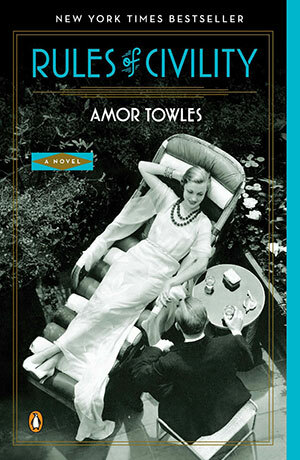 Why did you decide to write a book set in the late 1930s; and how did you research the period? A. I’ve always had a great interest in the period between 1900 and 1940 – because it was a period of such incredible creative combustion. In retrospect, the pace of change in the arts and industry in the 19th century seems pretty glacial. Painting, music, the novel, architecture were all evolving, but at a pretty observable pace. Then in the span of a few decades you have James Joyce, Nijinsky, Cubism, Surrealism, jazz, Henry Ford, Sigmund Freud, the Russian Revolution, movies, airplanes, skyscrapers and the general upending of received forms in almost every area of human endeavor. A. Some writers like John Cheever and Raymond Carver seem to draw artistic energy from analyzing the realm of their own experiences – their social circles and memories and mores. I’m one of those who draw creative energy from the opposite. I prefer to put myself in an environment that’s farther afield and look through the eyes of someone who differs from me in age, ethnicity, gender and/or social class. I think a little displacement makes me a sharper observer. It’s that challenge of trying to imagine what’s on top of the dresser – the small thing that’s always there on the periphery that somehow brings events into focus. A. None of the characters in the book are based on anyone in particular. But three of my grandparents and a great grandmother lived into their late 90s or early 100s. My maternal grandparents lived across the street from me in the summers and I’d see them every day. Over lunch when I was in my twenties, it was great fun to talk with them about their lives between the Wars – when they were young adults. My grandmother, who was simultaneously a woman of manners and verve, fended off marriage proposals until she was 30 because she was having too much fun to settle down. Like the book’s narrator, she pushed a rival in furs into the drink before ultimately accepting my grandfather’s proposal. A. One of the central themes in the book is how chance meetings and offhand decisions in one’s twenties can define one’s life for decades to come. I think there is something universal about this dynamic; but it was certainly my experience. My first night in the city, I got invited to a party at the home of an acquaintance. There, I met a few people who ultimately became close friends. In retrospect, a number of careers and marriages sprang from the intersection of social circles at that party – but we certainly didn’t realize the importance of the encounters at the time. We were just meeting for drinks, making haphazard alliances and cursory decisions, shaping our futures unwittingly. A. I certainly hope so. I think the book’s themes of self-invention, aspiration, love & loss, are recognizable in any corner of America. But one interesting aspect of New York is that it is a leading capital for advertising, art, broadcasting, fashion, finance, food, journalism, music, publishing, theater, etc. This means that every year, young people from all over the world with very different backgrounds, interests and ambitions descend on the city. They are all looking to establish connections (in the E. M. Forster sense as well as the networking sense). This just increases the odds that the person you sit next to at a diner could change your life. A. I’m very interested in periods where there is a density of creative invention: Like the early Renaissance in Tuscany (with Massacio, della Francesca, Botticelli and Donatello), or jazz in the late 50s in New York (with Davis and Coltrane and Monk and Gillespie); or crime drama on TV in the 70s (with Kojak, Rockford, McGarrett, and Columbo). Throughout history there seem to be these brief periods when a group of varied talents come together and advance a whole art form by leaps and bounds. In some semi-competitive or cooperative dialogue, the players bring out the best in each other by spurring inspiration and risk taking, while defining new forms and frontiers. When I find a period like this I like to delve. Initially, I imagined Tinker as an avid student of the period. But once into the book, I happened to pull a collection of Washington’s writings off my shelf, which led off with his “Rules of Civility” – and I knew right away that the “Rules” should be the primary thing that Tinker had studied. My book investigates social stratification & manners, character & appearance, ideals & compromise – and Washington’s youthful list somehow seems at the heart of the whole crazy matter. A. I’m not a sociologist, but it seems to me that the composition of America’s social strata has changed in meaningful ways since the first half of the century. The Second World War and the GI Bill were great leveling influences, in which many working class individuals migrated from their ethnic communities towards a more homogenous middle class. At the same time, the aristocratic families of the 1920s began to abandon the outward pomp of cotillions and tails. Wonder Bread, Budweiser and Chock Full o’ Nuts found their place in pantries high and low (with consistency and low price being attained at the expense of differentiation and flavor). This convergence has had weird byproducts: The vast of majority of Americans, spanning a wide array of economics (from the statistically rich to the statistically poor), now identify themselves as “middle class”. And where in the first half of the century the struggling youth would have aspired to the narrow circles of aristocracy, in recent decades the affluent youth have aspired to the fashion and cadences of the streets. But having made these rough generalizations about transformation, I’d say that many aspects of 1930s social behavior prevail. We clearly still live in an aspirational society. We have just exited half a decade when virtually every tier of the American population has borrowed money in order to buy bigger cars and bigger houses with better fixtures. And we still have American youth in pursuit of success and stature, though success and stature today may mean wearing sneakers at a start-up, rather than a tuxedo at a country club. That book had five points of view and a series of complex events that had been roughly outlined. As an investment professional with two young children, this structure proved hellish. Every time I sat down to work on the book, I needed two hours just to figure out where I was. Worst of all, in re-reading later drafts, I often found that the material from the first year was the best. So in launching a new book, I decided it would be a distinctive first person narrative; all events and characters would be carefully imagined in advance; and it would be written in one year. After a few weeks of preparation, I started Rules of Civility on January 1, 2006 and wrapped it up 365 days later. The book was designed with 26 chapters, because there are 52 weeks in the year and I allotted myself two weeks to draft, revise and bank each chapter. I revised the book thoroughly three times over the next three years (mostly making it shorter); but the original constraint of a 12 month draft proved a much more effective artistic process for me than an open-ended one. Not coincidentally, the book opens on New Year’s Eve and ends a year later. Q. Would you ever write a sequel to the book? And what’s this I hear about Eve In Hollywood? A. When I finished writing Rules of Civility, I had no desire to explore the lives of Katey or Tinker further, feeling that everything I should tell you about their lives was already between the bindings of the book. That said, what I found myself wondering was “What happened to Eve?” To answer that question, I wrote a series of six interlinked short stories called Eve in Hollywood. For those interested, you may obtain a signed edition of these stories by contacting Shakespeare & Co. bookstore in New York City at (212) 772-3400, or by ordering from them online here. Fans of Rules and A Gentleman should be forewarned, however, that these stories will not offer the same satisfactions as my novels. Like Eve, the volume is slim and enigmatic. What it offers is a glimpse into my process including how I begin to develop elements of time, place, character, and tone. A. Around the time I turned 40, in reading Where Shall Wisdom Be Found, Harold Bloom’s tribute to reading literature for wisdom, I was struck by how little time I had left to read seriously. I figured I was lucky if I could read one book deeply per month. If I lived to 80, that was 480 more books. With that shocking consideration as a backdrop, three friends and I formed a group to read extraordinary works of literature. The acid test for books of inclusion has been that they have been proven by history to merit multiple readings in a lifetime. We started with Remembrance of Things Past and then read works of Twain, Whitman, Dickinson and Thoreau as a precursor to reading works of Faulkner. Then we did Cervantes and Borges before reading Marquez. Last year we read through Nabokov’s American period and we have now moved on to Chekhov and Tolstoy.